The Epson Perfection V370 features high dpi optical resolution as well as stitching software that will allow you to scan oversized images and stitch them together seamlessly. The Perfection V370 has highly customizable settings to accurately scan whatever kind of document you need including the options to scan in grayscale, black and white or full color, back light correction, dust removal, and adjustable brightness/contrast, color levels, etc. The Perfection series scanners also include transparency units for scanning film negatives. The Epson Perfection V600 has very high reviews among artists. It is incredibly similar to the V370 in just about every way, with a few differences: the optical resolution is very slightly higher (unlikely to make a difference for the average artist just needing to scan their work for prints or marketing materials), and the V600 allows for duplex scanning. Duplex scanning is the ability to scan two sides of a document at once. Either of these Perfection models are great choices, but if you’re simply looking for good quality at a good price, you’ll probably be perfectly happy with the V370. The Canon Lide 220 has a similarly high optical resolution and 48-bit color depth. The auto scan features save you time by making automatic setting selections for optimal image correction. A cool feature of the Lide220 is the ability to store and scan vertically, for home studios with limited space available. The Canon Lide220 boasts a 10-second scan time, ideal for scanning larger batches of work at once without wasting hours of precious time. Unlike the other scanners on this list, the DS-50,000 is a large-format scanner with a flatbed large enough to scan works as large as 11.7”x17”. 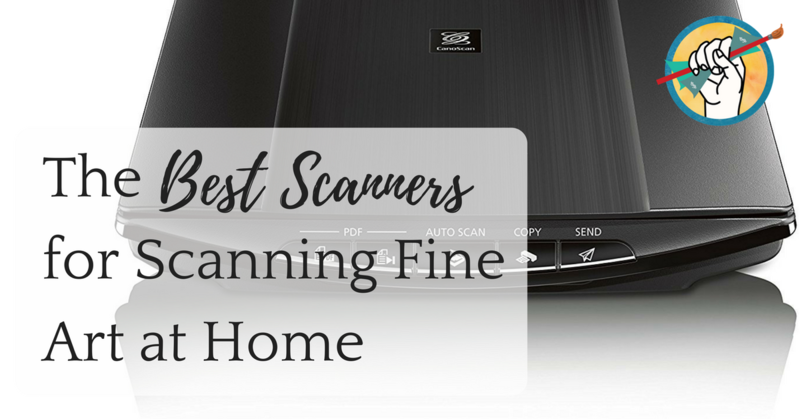 The maximum optical resolution is 600dpi, lower than the other scanners on this list, but still higher than the minimum you’ll want to for crisp images of your work. At a significantly higher price point the DS-50,000 is an investment, but if you work larger and can’t afford the extra time required to scan your images in sections and then meticulously edit together into a single image, the DS-50,000 may be worth it to you. If you’ve chosen to go the route of creating your fine art prints at home, you’ll also want to invest in a good printer. Check out our list of the best printers for creating professional-quality fine art prints without leaving your studio. Did we leave out your favorite scanner? Drop a note in the comments and let us know. Ready to sell your prints? I am really surprised (pleasantly) that you can get a home printer to do quality scans for this price. I am a graphic designer as well as artist and have used our high priced scanner at work to avoid paying fees ($15-$80) for scans. This is a great option! Can these scanners be used to scan oil paintings on stretcher bars? After reviewing and researching Epson Perfection V370, I found a few concerning issues that other artists should be aware of. Arcsoft Scan and Stitch may not be included with new scanners (since at least 2017) and is only available for PC’s. Scan and stitch software may be available online (I did not verify that it could be downloaded) for PC only. It is NOT available for Apple computers. Unless the artist produces artwork less than 8.5″ x 11″, this scanner may not work for most people. As for as stitching or joining, here is a link that may be helpful, https://www.sibleyfineart.com/tutorial–join-scans.htm I hope this is helpful for others doing the same research. Do you have any recommendations for an inkjet printer/scanner? I’d like a product to do both instead of purchasing a printer and a scanner separately. I’d like a scanner/printer so that I don’t have to use my computer. Thanks! Really appreciated this article! Needed a scanner for black and white ink images and this page came up on the first page of results for my search “art black and white document scanner resolution”. Saved me from doing a bunch of research, since I already trust the Abundant Artist for quality info. Super convenient to have links to buy right from here. Looks like the Canon Lide 220 is exactly what I was looking for. Thanks for this! Thanks for this article on scanners. I want to add to the mix in case other artists share my concerns. My work is generally small (under 8×10”) and on paper (I do book collage). Scanners have been a terrific way for me to photograph my work: quick, easy and even lighting. If you plan on printing at say 4x the size of your original art, a camera photograph is not hi res enough, you need a scan. So all this was working, and then I began to work on wood panels. Because the glass platen is slightly lower than the housing of the scanner, if your piece is larger than the platen, your scans will not be in focus. The plastic housing holds the work about 1/8” above the glass and that is just enough to ruin the scan. There should be a way to modify the scanner to remove the plastic housing, but so far I have not been successful in my modification efforts. If anyone knows how to do it, we all want to hear it! I’m looking for a scanner who scans the gold in my artwork in a way that it looks shiny. The scanners in your blog, are they up for it? The Epson V37o is NOT a good choice for artists. It consistently over exposes images and there is no way to adjust the scanner for that. Worse yet, if you are scanning watercolors on cold pressed paper, this scanner will EXPLODE the texture. Epson support is abysmal. -What is the date of this review? -I’ve heard that the Epson stitch software both does and doesn’t work on Macs or is glitchy. Is there a definitive answer anywhere? -Does Epson work with Photoshop to stitch scans or do you have to use the Epson stitching software? -Is there a way to detach the lids of the scanners whose lids don’t lie flat or aren’t designed to be detachable without making the scanner inoperable? -Is there an All-in-one that has a good scanner (and works with Macs)? -Does theabundantartist ever answer questions after they post a review? I just found a MicroTek ScanMaker 9800XL on ebay for $800, bargained down to $500 + shipping. This is a 12×17 Large-Format Flatbed 48bit Color Scanner – 1600×3200 dpi, with Firewire, SCSI and USB2 interfaces. This device exceeds specifications of newer scanners costing 2 to 3 times as much. I absolutely have to have tabloid sized scanning capability. Combined with VueScan software, this legacy scanner will run with full support on the latest mac and windows (and even linux!) systems. For those of you having difficulties with proprietary scanning software, check out VueScan from Hamrick Software.